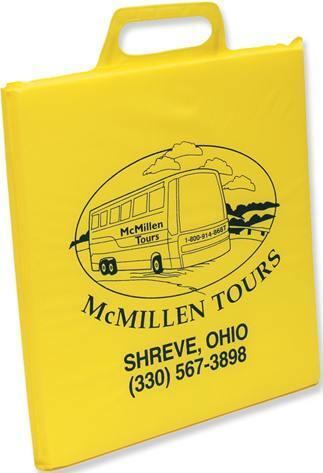 Custom Portable Stadium Seats -Cushions, Personalized in Bulk. Promotional, Inexpensive. Budget Prices in the USA and Canada. Fast Delivery. Best stadium seats -cushionsmade of durable 12 mil. vinyl with high-density foam padding. Just right for bleachers or bench sitting. We also supply bulk blank (not custom imprinted) stadium seats for $2.59 each. Free artwork design. Budget Prices in USA and Canada for wholesale stadium seats -cushions. American clients pay no taxes. Prices include your 1-color custom imprint. You may order any quantity above the minimum. ADDITIONAL IMPRINT COLOR OR IMPRINT LOCATION: add $0.35 per color, per location, per stadium seat. Please note the production time will increase with an additional imprint color. BLANK STADIUM CUSHIONS: $2.59 each, minimum 102. PRODUCTION TIME: 5-7 days after art approval, Blank (not custom imprinted) stadium seats ship in 3 days: contact us if you need fasster delivery. RUSH PRODUCTION TIME: 3 days after art approval: add $0.35 per stadium seat. Material: 12 mil. phthalate-safe vinyl and high-density foam padding. Stadium Seats Colors: White, Red, Yellow, Royal Blue, Navy Blue, Green, Maroon, Orange, Yellow, Black (see photo). PRODUCTION TIME: 5-7 days after art approval for 1 color imprint. RUSH PRODUCTION TIME: 3 days: add $0.45 per stadium seat. SHIPPING: from Pennsylvania or New York.